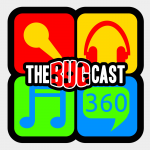 the bugcast 361 – It’s a music contest? This week on The Bugcast: we go Full Circle with a trip back to 2008 and play tracks from the first 10 episodes, plus we pay tribute to the legendary BB King. The next live show will be episode 361, which will be broadcast live in the chatroom on Friday 22 May 2015 at 21:30 UK time (GMT/UTC).